Experiments with wet-moulding leather, using pricking irons and stitching with proper waxed cord. 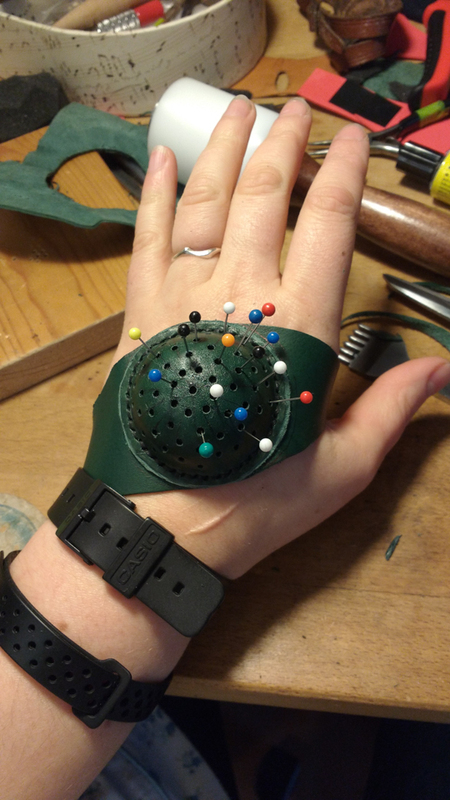 I’ve been using a jury-rigged back-of-the-hand pincushion for many years, and finally decided to make a proper one. The dome is wet-moulded – stretched over a thermoplastic form and stapled down to a piece of scrap wood. Once it was completely dry I was surprised by how strong then resulting dome was. The punched holes are backed with a piece of linen, and the dome is stuffed with synthetic stuffing fluff. Using pricking irons to make the holes made life a lot easier than last time I did any leatherwork, and doing proper saddle-stitching with waxed cord was also a revelation. I was concerned that it would be annoying to find the holes when replacing a pin, but I haven’t had any trouble, and the pincushion is very comfortable and convenient to use. The second piece here is a sheath for the knife I made at a Green Wood Guild workshop, which includes a wooden liner tray to stop the blade cutting straight through the sheath. Cling film to prevent rusting from the wet leather and a LOT of clamps made the exercise pretty straightforward. I decided I fancied wearing a pair of antlers at a recent event. 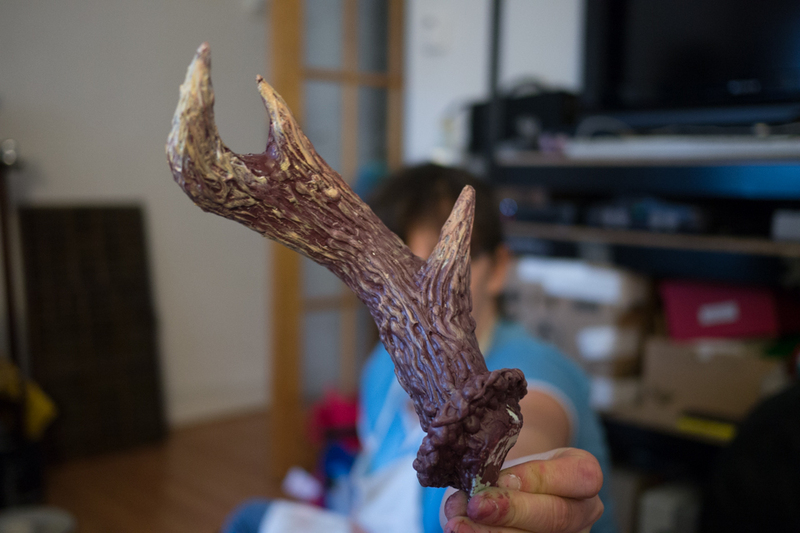 Here are a few pictures of the process from a foam pool noodle to a wearable set of prongs. I regret painting them gold (mostly an accident! ), and if I remake them I’ll take the opportunity to make them more realistically thin, but they’re still eminently wearable. The starting point is a lightweight, flexible plastic foam pool noodle. After carving with a large knife and pair of scissors. The prongs are made by cutting a deep slot and wedging it open with scraps of foam. I covered the lot with masking tape, but if I’d had time to papier mache it, that’d have been much better. A base coat of acrylic – couldn’t quite get the colour right. I was so happy with the way that dry-brushing brought up the texture and made it look more realistic. Now, I sealed the surface with a coat of neat PVA, but unfortunately I thought it’d be a good idea to incorporate a slight gold sheen. I misjudged. The band gives stability, and the clips extra security. 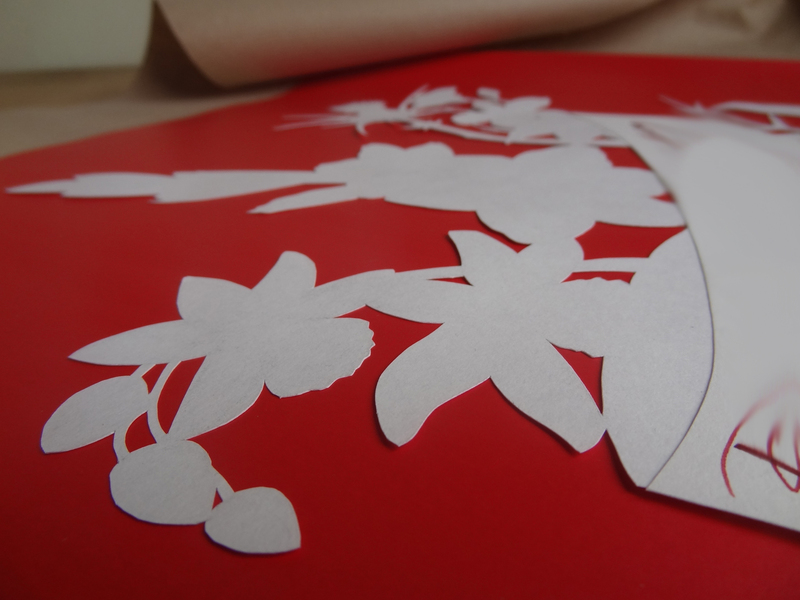 Another papercut – a ‘card’ for a ruby wedding anniversary, including flowers representing locations from the couple’s life, and a Gladiolus which Wikipedia tells me is the appropriate flora to celebrate 40 years together. The red calligraphy isn’t nearly as good as my housemate’s, and I had to do a second pass to thicken the downstrokes as my dip-pen lacks that functionality, but I’m pleased overall. I decided to sit down and figure out how to make an embossing set-up at home. I used my favourite material – a thermoplastic called ‘polymorph’ or ‘friendly plastic’ – something that’s as springy and tough as nylon, but melts at 60 degrees C, in hot water from a kettle. Previously I’ve followed tutorials for embossing paper using a cardboard stencil and rubbing the back with a rounded tool, as per this tutorial, but it’s fiddly, time consuming and inconsistent. I’ve seen franking machines that use positive and negative aluminium dies, and thought I’d give it a go using things I had laying around. 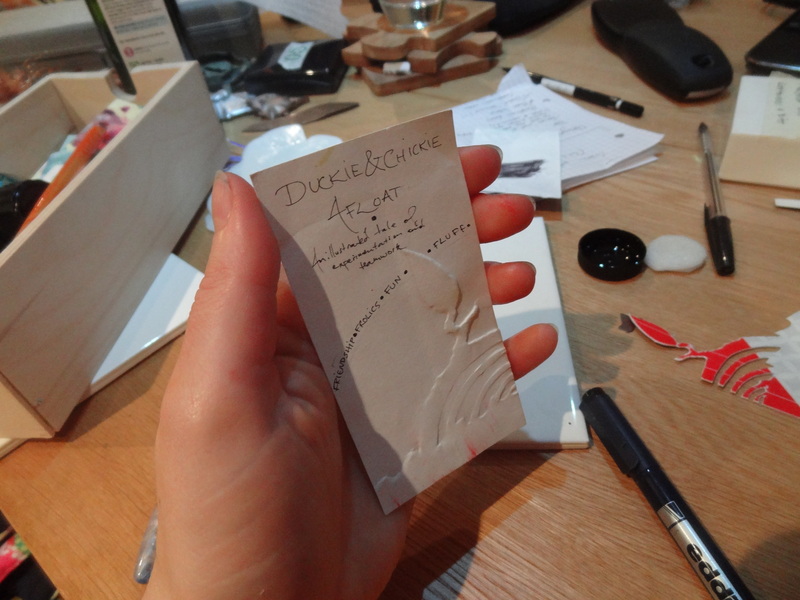 I’ve devised something that gives lovely results, simply, and is very easy to use – just slip the paper into the hinged die, and squeeze. To test the theory first, I used a cut-out piece of copper sheet as a template and thermoplastic as my die-making material. Starting with a 0.8mm thick ‘positive’ – an ivy leaf cut from copper sheet. The two parts of the thermoplastic die are fused by heading and squishing the edges together – nice and springy. A test sheet, showing how the ivy leaf die works. This is thin card. Here’s a step-by step breakdown of the process of making a more involved die, suitable for making business cards. I was inspired by one of the images from my book ‘Duckie and Chickie Afloat’. 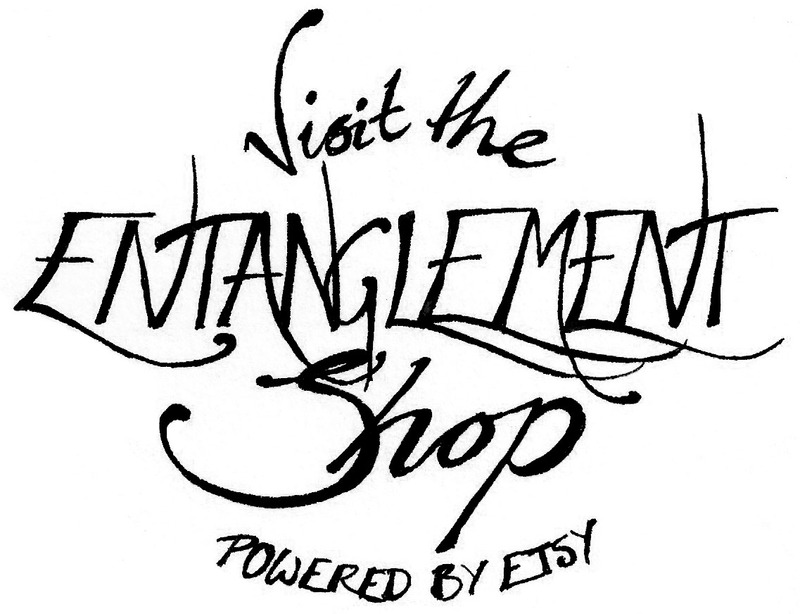 For later versions, I’d like to add registration to site the paper accurately, and also explore multi-level or carved positives to give more intricate embossing. This is the sheet of packaging plastic I used to make more positives. I think it’s about 1mm thick. Heating up pellets of thermoplastic in hot water from the kettle. You can’t use plastic containers or it’ll stick. I placed the plastic template on a ceramic tile, smoothed over a wad of hot thermoplastic, and sandwiched it with another tile before standing carefully on the stack to squash things together. Separating the tiles reveals the plastic positive is neatly embedded in the thermoplastic. Holding it up to the light shows the thinner area really nicely – I know it’s rather hard to spot in the photos. Liberally coating the negative layer with oil (olive was closest) prevents the second layer of thermoplastic from sticking to the first when you push it into the crannies of the design. After cleaning the two parts and holding them together, I reheated one edge until the thermoplastic was clear, soft and sticky again, and squeezed them together, locking the two parts and forming a cool springy hinge. This is testing the embossing using some watercolour paper. Slightly dampening the paper made it a lot easier to make the impression. This is slightly longer than a standard business card but I’m pretty pleased. As part of my Science Communication MSc, we were challenged to produce a ‘cultural product’ which explores some of the concepts from the first term’s lectures on the history of science and society and science and the media. Our trio elected to use stop-motion to portray a ‘day in the life’ of a scientist who is crafting a scientific paper. Many ideas related to the creation of science are depicted; how many can you spot? Created by Nils Hanwahr, Morag Hickman and David Robertson at Imperial College London. Music credit: Overture by The Who.